(APN) ATLANTA — An estimated one thousand people, most of whom represented minimum and low wage workers, rallied outside of local Atlanta McDonald’s, Burger King, and Walmart businesses on Wednesday, April 15, 2015. This protest was a joint action in a wave of other protests happening nationwide on the same day under the campaign “Fight for $15,” which has seen growing traction in the past few years. 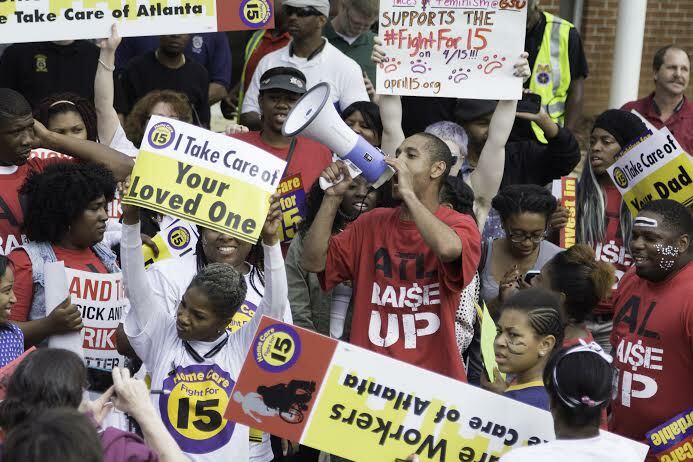 Fight for 15, the movement to raise the minimum wage to fifteen dollars and secure union rights for workers, began in 2012 in New York, where a couple hundred fast food workers went on strike to protest wages too low to support themselves or advancement. Since then, the movement has grown to having strikes and rallies in over two hundred U.S. cities. “I do the work because I love it but going home and not being able to take care of myself is the reason I’m fighting for fifteen,” one home care worker told Atlanta Progressive News. Workers rallying in Atlanta had support from grassroots organizations and labor unions. Representatives from groups such as Rise Up Georgia, Georgia Southerners on New Groups, the National Association for the Advancement of Colored People, Atlanta Jobs with Justice, and many others were in attendance throughout the rally. The crowd of protesters marched from the library steps of Clark Atlanta University to the McDonald’s located near Martin Luther King Jr. Drive, where dozens of them rushed in chanting such things as “Fifteen and a union!,” and encouraging the McDonald’s employees to join their movement. The crowd filled the building and extended out the entrance door in a swell of people reaching out into the parking lot and even further. The protesters stayed at the location for over ten minutes, before it finally turned course, marching further away to the nearby Walmart, where they were met with resistance by police officers barring their entry. The protesters then continued to chant, stand, and march around the parking lot for around thirty minutes before finally marching away and dispersing. Lazy fools! You are not worth 15 dollars an hour. And neither is the job your doing.